Indeed. Guzzi's biggest trouble will be that they don't build enough to get anyone inteterested in doing the work. The off the shelf settings they can run to don't match their bespoke engine. I can see the point of ASR (Automated Spin Regulation in Ginglish) when trying to ride a 150HP sports bike through London traffic in the sleet. Push the button and it gets closer to the 250cc machine that would be the more suitable tool. You are looking at the surface and traffic not trying to avoid the extra 0.05 degrees of throttle that'll spit you off. Its the same relationship used when the back axle is 25 feet away and 20 tons will kill people even at the sort of speeds it can achieve travelling sideways. Why you want this on a 48 HP retro-styled bike is beyond me, but remember we were trained Americans just go buy one and think it'll behave like a Buick. ABS has saved my sorry arse twice. One day ASR may do the same. I will take all the assistance offered, thanks. Phil, how is the Himalayan shaping up - any issues? Has it reached the first service yet and if so what did it cost? I have heard conflicting reports on reliability, build quality etc but you are only person I "know" who actually has one! Both my road going offs would have been helped by ABS. I was saved from an even nastier one when a learner SMIDSYied me and the instructor stopped her mid pull-out to guarantee it. The escape route was onto wet painted chevrons and while BMW's 90's technology feels like its from the 1390's it worked. I can only think of one occasion when ASR would have reduced the dry cleaning bill. Why I expected the wet manhole cover to provide enough grip to transmit 80HP to the road is beyond me now, but my MX skills were up to it. ASR has a flaw which needs to be turned off. If you set the reaction down to 2 kph when the wheel sensors cease activity you can have a situation where you cannot set off. Rear wheel is doing 5 kph, front reads zero, back off the throttle and thus never move. You need to be able to spin up the back wheel to some extent. On a bike it also needs to detect wheelies. As its not legislated they'll just let you turn it off. ASR has a flaw which needs to be turned off. If you set the reaction down to 2 kph when the wheel sensors cease activity you can have a situation where you cannot set off. Rear wheel is doing 5 kph, front reads zero, back off the throttle and thus never move. You need to be able to spin up the back wheel to some extent. Andy, I'm not sure I follow what you are saying here. It sounds like you've made a theoretical objection that never happens in real life - as we know because of all the bikes out there with ASR. Obviously I've misunderstood you - could you clarify? did you mean ‘1390s’ or ‘1930s’? Either way it’s funny and, having owned a 90s K100 I can see your point! Interestingly (or, probably, not) neither time the ABS saved me was an actual emergency. I seem to be able to avoid most of those situations. On both occasions I was carrying out a low speed stop and just not really paying attention. And on both occasions the total lack of grip came as a complete shock as my befuddled old brain tried to work out why I wasn’t stopping! The first time was on the K100 and the crude (although pretty ‘state of the art’ at the time) system had the forks pogoing as the ABS cycled. The other time was on a Tiger 800 which was 20 years younger and light years ahead - no drama, just a smooth, controlled stop that simply took a little longer. Definitely 1390's. There's stuff in those old systems that sounds like a rusty drawbridge coming down. If you try setting off on snow, ASR can stop you. You need to spin the back wheel to dig in, add contact area or get to tarmac and then it'll go. We reprogrammed or fitted off-switches to a lot of trucks back in the day. If you find your Moto Guzzi on an icy hill, remembering its not too well adapted to the engine it could do the same. I have heard of a GS that sounded like it did it on sand. Given the lack of off road ABS on GS's, I think it's possible if you use your bike in the way they do in the promo pics rather than how they really think you will. Extra thought though, with a bike pushing with your feet and getting the front wheel to turn would bring power back to the back wheel. Not something you can do with 32 tons of green lorry. My wife caught the train up to London this morning to spend the day with our Daughter so after I dropped her at the station at 9am I popped into local bike dealers Hayballs and took this out for half an hour. Bloody chilly, especially with open face helmet on but I only did a 16 mile loop with quite a lot of that in villages or through Salisbury so didn't get too cold. The bike had 600 miles on the clock and started first press of the switch settling to a smooth tickover - already one up on my Ennie. Clutch and throttle nice and light and the gearbox was a real gem, even from cold. The first few minutes was out of the industrial estate and through a 20mph section and I was immediately comfortable with the bike and able to trickle along, feet up, at walking speeds. Fueling is very smooth and no need for clutch slipping at slow speed, pulls very well from low revs with a nice burble from the exhaust. Suspension is set up quite soft (the rear shocks were on their softest setting) but bike handled well for the short time I had it and no weaving or sense of vagueness at high speed (I was fortunate to find a short stretch of private road in which it wound up to 90 on the clock with more to come) despite the high bars. The brakes seem well suited, I tried the ABS out on the rear which didn't seem overly intrusive and the front hauled the bike up quickly when I tried a couple of hard braking checks. The footrests are a little further back than I would like, most un-Enfield like, but I got used to them pretty quick and I don't think they would be a problem. I would adjust the bars though as they were quite upright and I felt twisting them to bring my hands a couple of inches further back would have felt more natural feel. 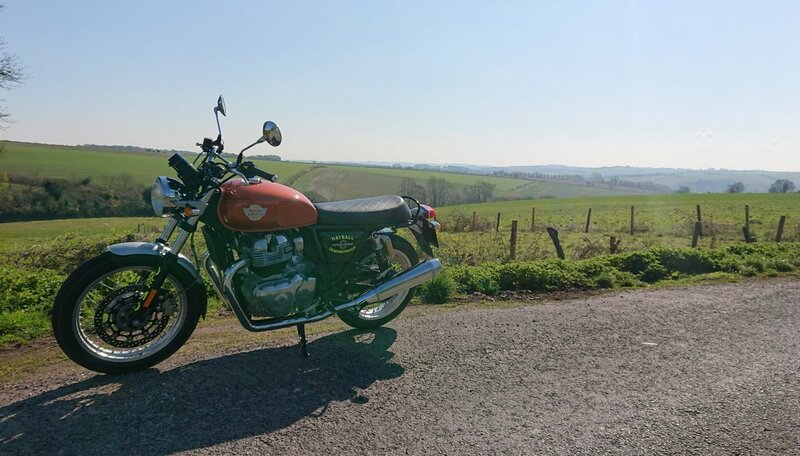 The seat was a little hard, not uncomfortable on the short trip I had but would want a longer ride check it out, seemed enough room for a pillion and I would think it would make a very nice Sunday morning potterer but have enough about it for longer trips. Enfield really seem to have put together a nice engine/gearbox combo, a very decent first attempt and really a decent bike even if you ignore the absolute bargain price. I was using my 2015 Guzzi V7 as a comparison and I would say that the Enfield is a nicer bike, smoother, much comfier suspension, brakes as good if not slightly better, no silly intrusive traction control and better fueling. Not quite the character, possibly a little too smooth, the parallel twin felt very similar to the AT when wound up, although not as powerful of course. At £5699 it's an absolute bargain and, if I was in the market for a bike it would get my cash over the V7 but I don't think I'll be trading the V7 as any improvement is marginal and it doesn't look as nice as the V7 (IMO) and lacks that v twin character. I wouldn't argue with anyone who tells me I'm wrong though, the Interceptor really us a very nice motorcycle, well done Enfield. Certainly looks like a motorcycle should. As to TC I had an early GS1200 LC. It had numerous issues with gearbox, rear brake etc. However one thing that nearly got me was the TC. I was coming out of my drive and turning left. I saw a car in the distance and thought I had more than enough time. Started to move off and did another glance to my right to see that he was probably going at least 60 in a 30. I gave it a handful and the TC kicked in and the bike died. Fortunately the driveway had a wide exit slope so I was able to pull the clutch in and precariously wobble on to the pavement as the car flew by. My fault for misjudging the speed of the approaching lunatic but had I not had the presence of mind to pull in the clutch and coast left it would have been down to me. However, technology does have a place and probably saves more than it causes. Wife was driving with the grandson the other day and he was most impressed when the anti collision system kicked in to save them as a woman pulled out in front of them without looking. The wife said she was about to press the brake pedal when the car took over and carried out an emergency stop way more aggressively than she could ever have done and more importantly much quicker than she could have done. Result no collision. Audi Q2 saves the day. ….. the anti collision system kicked in to save them as a woman pulled out in front of them without looking. The wife said she was about to press the brake pedal when the car took over and carried out an emergency stop way more aggressively than she could ever have done and more importantly much quicker than she could have done. Result no collision. Audi Q2 saves the day. One fact which motor manufacturers discovered was that many (most?) drivers don't use the brakes hard enough in an emergency stop, hence the "emergency brake assist" function on some cars which senses what is probably an emergency application and it adds a bit more. Most of these sort of safety features are very good. Yes it's a relatively easy (technology challenge aside!) win as not something, done well, that impinges on driver convenience yet delivers a significant boost to safety. I guess it's human nature not to want to throw everyone, and everything, around inside a car unless it's a 'real emergency' and by the time the brain computes that it is and asks the foot to deliver full 'stamp on mode' it's often too late whereas the autonomous systems don't have that to consider. Whenever I think about ‘emergency brake assist’ I, somehow, picture a huge mechanical boot swinging down from the steering column and mashing down on the pedal! That is one seriously good looking bike. I've a soft spot for Enfields after my grandfather, attempting to recapture lost youth, bought a Bullet 350 about a decade ago. This was just before they put EFI or starter motors on things and the gearchange was still the other side. Poor thing barely saw the light of day but it was jaw droppingly beautiful. It had real class; something the Interceptor 650 seems to have in droves. Add to that that RE seem to be really pulling their socks up in terms of quality of late...It's the first 'classic' styled bike I've ever looked at and honestly said 'I would part with my own money for that'. I reckon Triumph should be rightly a little worried about the Street Twin. The brakes in the Q2 are fierce at the best of times. I really have to literally 'tread' carefully when I go from my Octavia to the Q2. I have never experienced the full anti collision stop but from what the wife and grandson say it was extreme. Hes had enough time at the hospital already so well done Audi. I agree Ciaran, a very pretty bike. I came across a calendar of 'British Motorcycles' yesterday. Cover image was the Norton 850 Commando in Silver. A true thing of beauty with some DNA that has been extracted from the Spitfire or Lancaster. Some other lovely bikes onside but none came close. When I first saw a Thruxton R in the flesh at the 1066 it had that similar quality of just looking so right. I actually thought for a moment it was a Norton. When I get a free day I'm going to try one out at my local dealer as may swap my Guzzi V7 in for one. They look great and may have a bit more room for me than the Guzzi but the thing that may put me off, weirdly, is if it's too smooth. I tried the Himalayan and liked it a lot but didn't seem to have the character of my Bullet, which is probably a good thing for sales but not for me. I really hope the 650 has something about it rather than just another bland twin motor. One definite plus is that they don't have the pointless traction control that mars the Guzzi. Got my first close up of one today when a guy rode one into Kent M/Cs carpark. For me it sounded how a bike with those looks should sound. It appeared to be a good quality machine for the price. Just thinking outside the outhouse,,,maybe if it was abit crude (inbuilt soul) that would attract a certain crowd,,,What I mean is everything these days is so slick,so polished,,it all works just so...Maybe people want abit of a challenge,,,in the same way Trev bought a 500 bullet not for the speed /reliability/or sexappeal,,but for something else...Maybe thats the crowd RE should go for... oh I,m on my third glass!! !